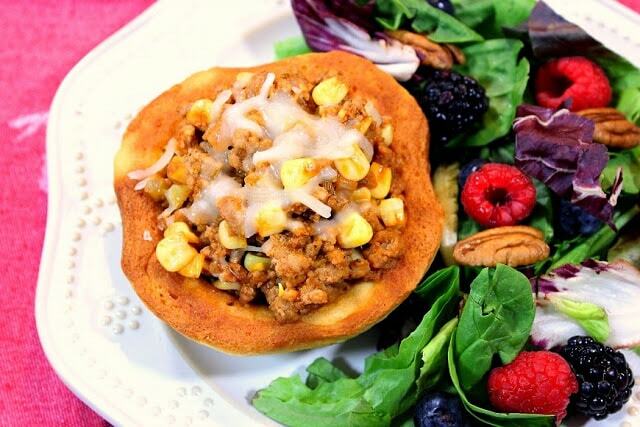 This kid friendly recipe of BBQ Turkey in Corn Muffin Bowls are as fun to make as they are to eat. They’ll soon become a family favorite. The inspiration for this recipe came from the refrigerated dairy case at my local grocery store. While I was standing there looking at tubed crescent rolls (you know the ones), I spotted these tubed corn muffins which I had never seen before. From there I immediately thought of biscuit bowls and all the yummy things you could fill them with. These bowls are so super easy to make and they can be made with any tubed biscuits (or homemade biscuit dough for that matter). All they require are a couple of upside-down muffin tins and a little baking spray for easy release. You can also get as creative (or simple) with the filling as you wish. If you’re looking for a real time saver, what about some already prepared shredded bbq pork or chicken right from the grocery store? You can’t get much easier than that! 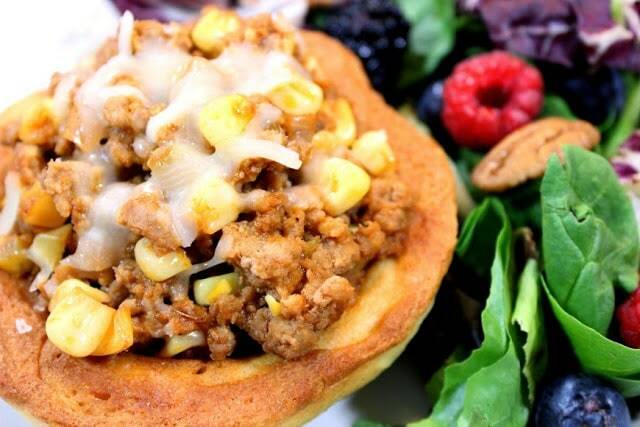 For this particular recipe however, I chose to make some homemade BBQ turkey filling and included some frozen corn kernels to play up the flavor of the corn muffin bowls. 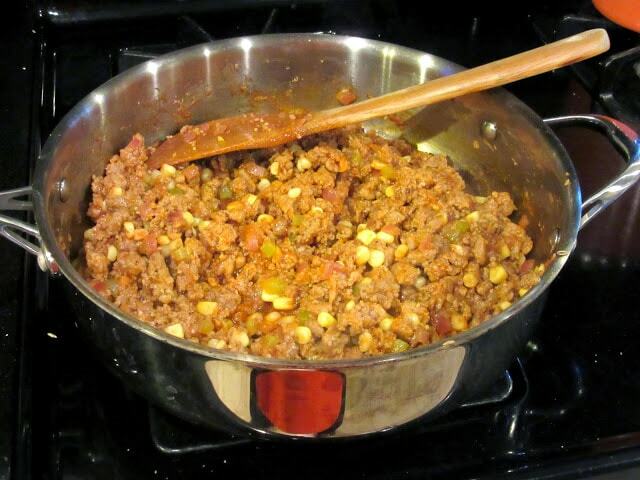 Of course you can substitute ground beef for the ground turkey in this recipe if you prefer, but with the addition of the fennel seed that I’ve added, the flavor of this filling using ground turkey is super delicious! -Preheat oven to 350 degrees. 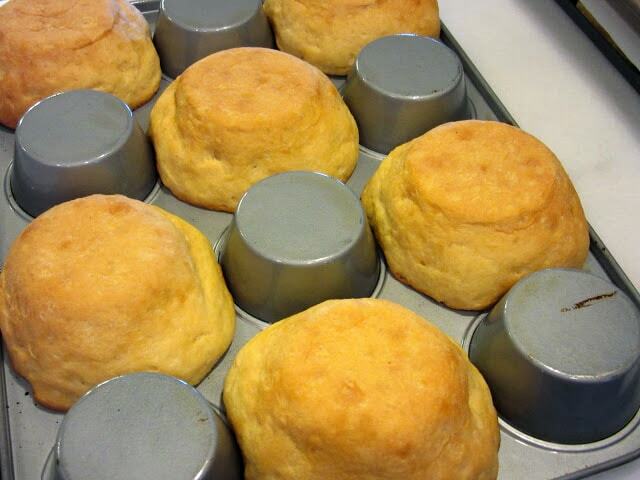 Spray the bottom of 2 muffin tins liberally with cooking spray. 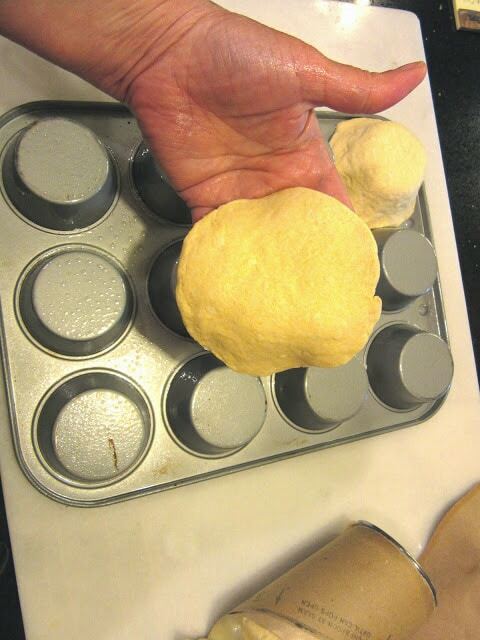 Flatten the tubed muffins with your hands to form a large disc, and gently press each dough disc over the bottom “cup” of the tin, Make sure to space them apart so they each muffin bowl will have plenty of room to rise and bake and not stick together. Bake in a preheated oven until golden brown (approximately 15-17 minutes). 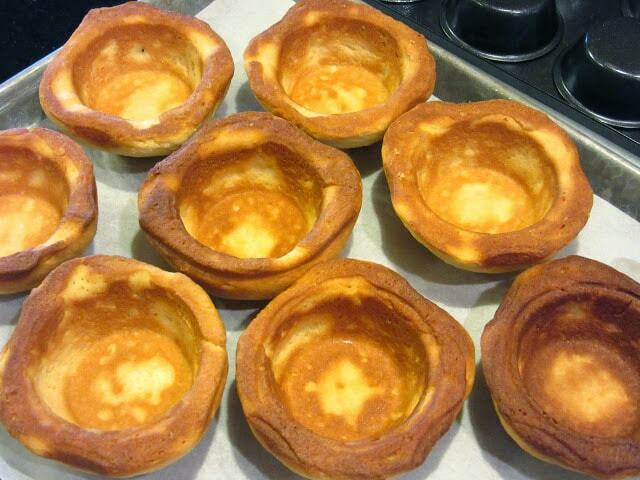 Immediately remove from the oven and place a baking sheet on top of the muffin bowls. 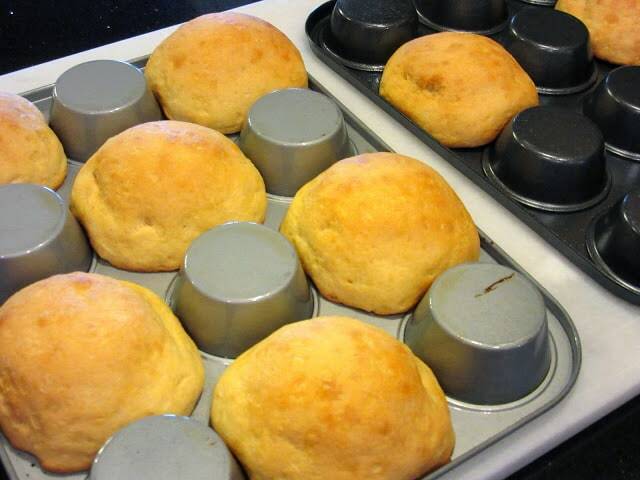 The reason to do this is so as the muffins cool, they’ll have a flat bottom so they’ll sit nicely on the plate. 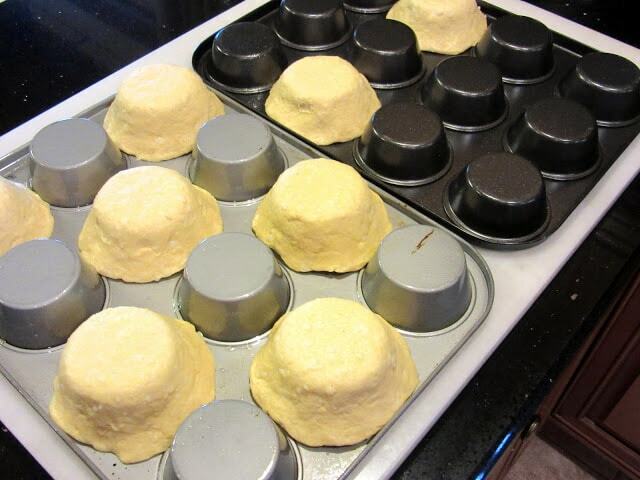 Allow to cool and then pop the muffin bowls off the muffin tins and set aside until ready to fill. -Meanwhile in a large skillet brown the turkey in olive oil and season with salt and pepper. 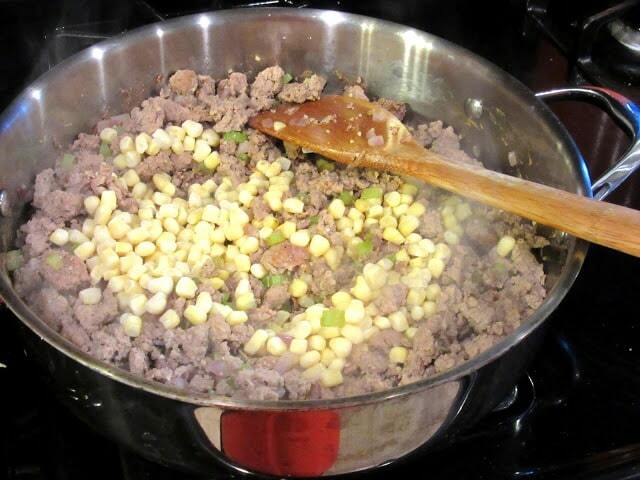 Stir in the celery, red onion, garlic, fennel seed, corn, apple cider vinegar, ketchup and brown sugar. Cook stirring occasionally until the mixture is heated through and the turkey is no longer pink. 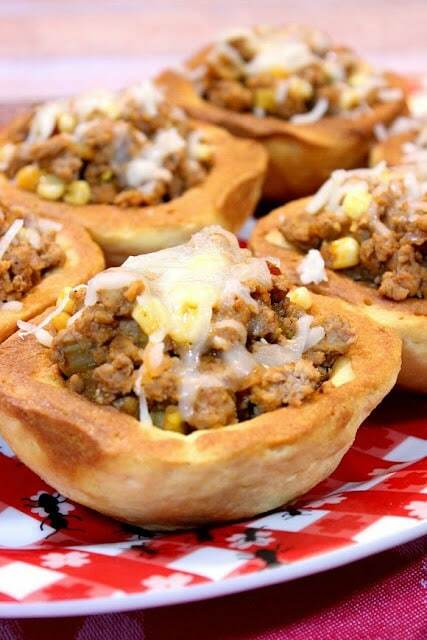 -Fill each muffin bowl with a heaping amount of the BBQ turkey filling and top each with a bit of the shredded cheese. Return the muffin bowls to the oven and heat until the cheese is melted. Serve immediately. Better stand back…your family is going to devour these!!! I’ve recently opened a new shop on Etsy where I’ll be showcasing my hand painted aprons and glassware. I’m super excited about this new venture and can’t wait to paint something for you! 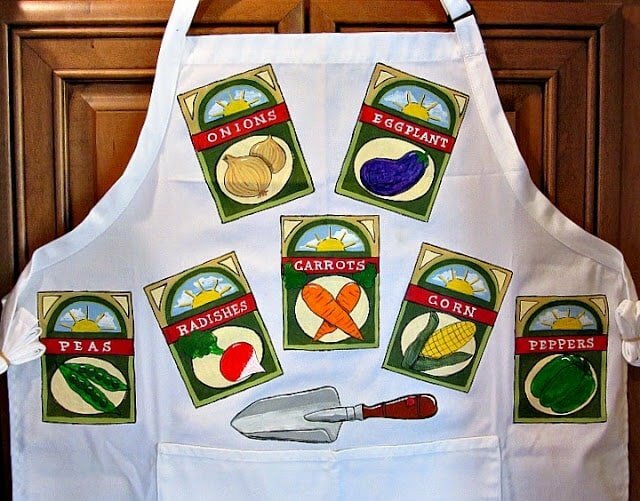 Custom food blogger aprons are my speciality but you don’t need to be a food blogger to order from me. Please contact me to discuss your design or visit my shop to see the items I’ve stocked the “shelves” with 🙂 KUDOS KITCHEN PAINTS. 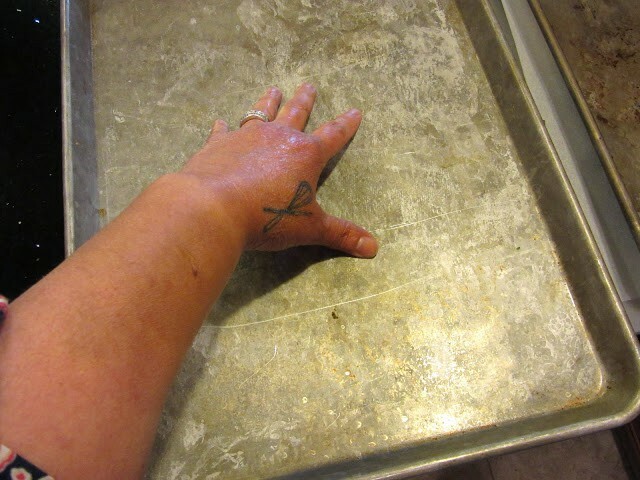 Kudos Kitchen by Renee and Kudos Kitchen Paints ~ Where food, art and fun collide on a regular basis! 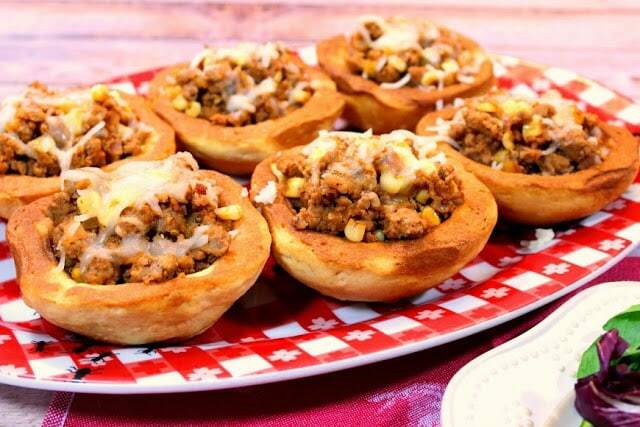 I love the filling in these and great tip on buying the grocery store prepared shredded meat! That would be great in a pinch. Love the tube corn muffins cup idea! Looks so good! Such a creative idea! My family would really enjoy these! What a great idea! 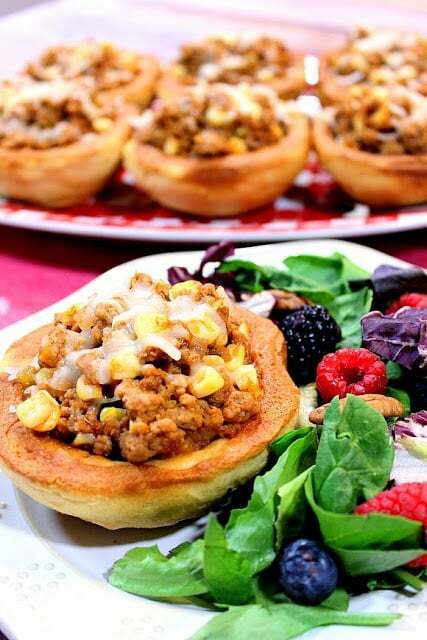 Love those corn muffin cups and the filling sounds incredible! Renee, this is such a fun idea! I've never noticed the tubed corn muffins, but now I'll make a point of looking for them…because I really want to try these; I know they'd go over well in my house. These looks and sound like such a fun idea; thank you for the detailed picture instruction on how to bake the muffin cups. Tubed corn muffins?! That sounds awesome. Good thing we don't have those here or I'd buy them ALL the time. These little bowls sounds like a great use for them! I love them, everyone has their own, and they can make them the way they want. What a fun idea! This would also be great for a kid's slumber party!